Grace McCarthy is a highly successful businesswoman who opened her first flower shop at 17-years-old and built it into five flourishing shops. Then she decided to take on a public role. She was first elected as a Vancouver Parks Commissioner, and then for more than 22 years, she was an MLA and cabinet minister, serving as Deputy Premier with several portfolios during that time. Retiring from public life, Grace McCarthy turned her attention to raising funds for research to help children with Crohn’s Disease and Ulcerative Colitis. She is a founder and president of the C.H.I.L.D. Foundation, which has raised over 10 million dollars, establishing the first chair in pediatric gastroenterology research in Canada at UBC and the first endowed program and the first laboratory at B.C. Children’s Hospital. Grace McCarthy is a woman with a list of firsts in her life: the first woman president of a Chamber of Commerce in Canada; first woman member of Variety International. 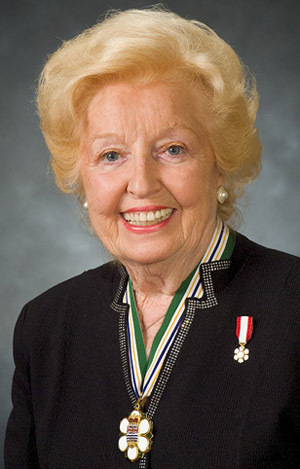 She initiated Canada’s first toll-free Help Line for abused children; successfully lobbied governments to enable women to own property without a male guarantor; she founded Canada’s first school of floral design, initiated the Vancouver Trade & Convention Centre, established Canada’s first linear parkway and initiated B.C.’s first film promotion office. The list of organizations and associations to which she has contributed, raised funds for, led and been given honorary memberships in, goes on for pages: from helping the handicapped, and advancing tourism, to initiating the process for British Columbia to host Expo ’86. There is even a Grace McCarthy Highway named after her in Israel. Grace McCarthy’s other highlights include: Officer of the Order of Canada; Honorary Doctor of Laws from UBC and Simon Fraser University; Honorary Fellow of the Royal Architectural Institute of Canada; Honorary Doctor of Technology from BCIT; Order of Distinguished Service Worldwide from the Salvation Army; Lions International Highest Award; Marketer of the Year; Brotherhood Interfaith Award; Variety Golden Heart Award; and BC’s Top Ten Citizens of the Century.